Recent developments in mobile tech have changed the way we travel, meet new people, work, and manage our time. New technologies have also changed how we approach our finances: from Apple Pay to mobile banking and expense tracking with Mint, apps help us receive, exchange, and transfer money conveniently. But what about investing? Investing and stock trading used to be a sort of elitist club to which few felt welcome. Investing was one of the things that millennials didn’t like about the world of finance; and this distaste for traditional stock trading options is exactly why the Robinhood app has been such a success so far, especially among the younger generation. 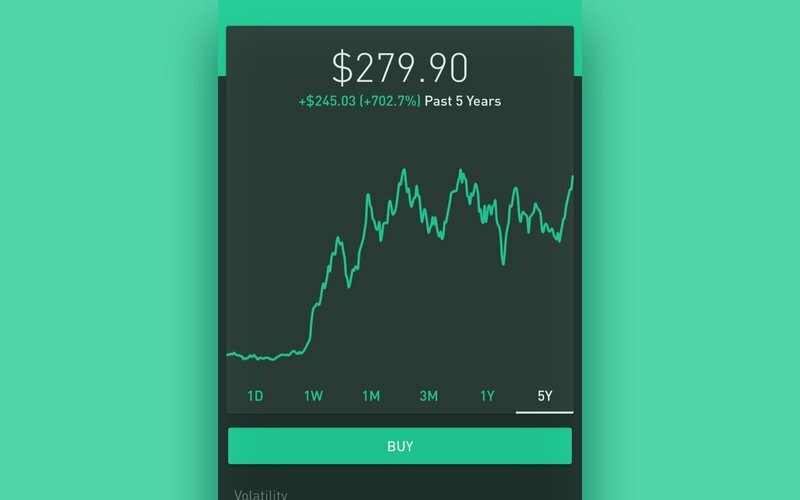 The Robinhood app lets users trade stocks for free and makes investing easy, even for people with no previous experience. What does the Robinhood app do? Robinhood lets users create an investment portfolio and trade stocks. Robinhood provides people with up-to-date market data. Robinhood notifies users about upcoming events like dividends on their investments. Both Robinhood and Robinhood Gold accounts allow users to trade without waiting for funds to “settle” as other brokerage apps often do. A selection of stock that can be bought through Robinhood is quite wide and includes stocks by tech companies like Apple and Tesla. What makes Robinhood so popular? It’s secure: all sensitive personal data is encrypted. Robinhood is a member of the Financial Industry Regulatory Authority (FINRA) and the Securities Investor Protection Corporation (SIPC). Robinhood has two main competitors – LOYAL3 and WiseBanyan – that also offer commission-free trades. These three companies each have different business models and positionings in the market. LOYAL3 and Robinhood are stock brokers, whereas Wise Banyan advertises itself as the world’s first free financial advisor. Robinhood is the more flexible of the three, as it allows users to buy and sell a wider range of stocks than LOYAL3. WiseBanyan operates as a registered investment advisor: they take their client’s money and invest it in a portfolio of ETFs (exchange-traded funds) while managing the dividends and rebalancing portfolios according to investor preferences. Apps like Robinhood seem very attractive to a wide range of entrepreneurs since they bridge the gap between professional stock brokers and people with no previous investment experience. As we mentioned, one of the key selling points of Robinhood is that the app offers commission-free trades. But that raises an immediate question: How does Robinhood make money? Is it safe to invest with the help of an app that might not have a sustainable business model? Robinhood even includes a “Learn how we make money” button on their landing page to tell their users how they make money. Robinhood can afford to keep their app free since the company itself is heavily backed by a number of big investors including Google Ventures and Index Ventures. The primary source of revenue for Robinhood is their premium offering called Robinhood Gold – an upgrade for users who are more experienced or want to take greater risks. Robinhood Gold requires a monthly payment and, in exchange, provides users with extended trading hours and increased buying power. Extra buying power means that users are able to borrow money if they want to purchase certain stocks. The monthly fee for Robinhood Gold, ranging from $10 to $200, depends on the tier to which a user belongs. The tier is determined by how much money is in a user’s account and how much they want to be able to borrow. Robinhood also collects interest on the cash and securities in Robinhood accounts in the same way that banks collect interest on their clients’ cash deposits. What else can users do with Robinhood Gold? Robinhood lets premium users buy on margin, though you must have at least $2,000 on your account to access this service. The amount of money a user can invest on margin depends on their investing experience. Robinhood Gold accounts also let users instantly invest money they have deposited. The exact amount available without a waiting period varies depending on the size of a user’s portfolio, but has recently increased to a $2,000 maximum. 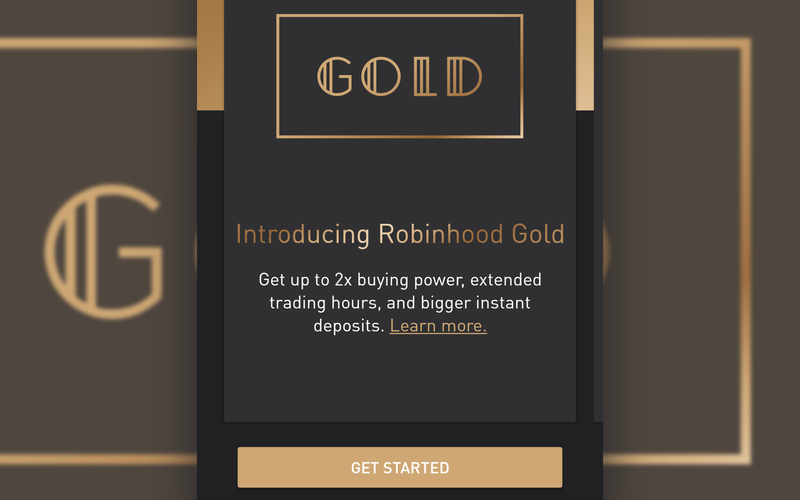 How can investors benefit from the extended trading hours available with Robinhood Gold? First, extended trading hours means that users can learn about changes in the financial positions of companies whose stock they might buy after the market has closed, and are still able to act on this information. Second, extended trading hours lets users account for the change in stock prices on Asian and European markets and the potential influence these changes might have on the American market. What challenges did Robinhood face? 1. Designing a mobile-first brokerage service. Mobile-first is an unusual approach in the world of finance, but the Robinhood team chose just that approach and made design their first priority because they realized that if the app wasn’t really simple and sleek, it would fail. This focus on design is one of the reasons why Robinhood became the first financial app to win an Apple Design Award. The mobile first approach also meant that Robinhood’s creators had to simplify certain graphics in the app. For example, Robinhood does not use candlestick graphs even though they are very common in financial apps; brokerage apps like Libertex commonly use them. Implementing candlestick graphs requires enormous attention to detail in calculations. As a side note, if you were to ever outsource such development, make sure to provide a clear set of requirements to your remote team. For those who are considering developing a brokerage apps like Robinhood, it’s worth considering whether or not you really need to provide all the finest details about daily changes in value. Since Robinhood targets millennials and people with little experience in stock market trading, it is likely that Robinhood users will not be aggressive traders; thus, information reflected in detailed candlestick graphs is not not especially relevant for Robinhood users. 2. Finding a perfect product–market fit. Robinhood app became as successful as we know it today after they were able to find their product-market fit with millennials. There’s nothing new about stock trading, but giving access to stock trading through a mobile app democratises this financial tool in the same way that Uber democratised car sharing: today, you don’t have to own a Bentley to ride in one. People immediately loved the idea of a simple stock trading app that doesn’t require commissions and is available to pretty much anyone – and that’s how Robinhood got its initial traction. The popularity of this service is proven by the fact that Robinhood’s creators ended up with more than one million people on their waitlist before the product was ready for launch. Almost two-thirds of aspiring investors on Robinhood’s waitlist wanted the app because their friends and colleagues had told them about it. To gain initial traction, apps like Robinhood have to clearly state what they offer to their potential customers. This value proposition should look something like this: We make trading accessible, and will help you invest your money in a smart and fun way. Trading apps like Robinhood have the same appeal as online banking apps: they make users feel in control of their finances and let them monitor what is happening with their investments at all times. 3. Developing an appropriate architecture for high-frequency trading software: three useful APIs for trading applications. Developing an app like Robinhood comes with a number of technical challenges. While developing a trading app we need to run a lot of tests. Because of limited market hours, however, it might not always be convenient to use real-time data. Another challenge when developing trading apps has to do with providing immediate responses – apps like Robinhood have to show stock market prices in real time. get quotes and manage orders. E*TRADE offers some SDKs too, which could be useful for the development of trading app like Robinhood, but the SDK documentation is quite short and needs to be more detailed for it to be truly useful. The API documentation is much more detailed and hands-on. search for the quotes, option strikes and news. Also TradeKing offers a new feature – Streaming, so now it’s possible to continually receive real-time data. The documentation for TradeKing is very easy to use, presents comprehensive information about every request and contains many code snippets to make the development much easier. Robinhood apps for both iOS and the web are developed using best practices and the newest programming languages, frameworks, and libraries to provide a fast, reliable, and scalable mobile trading experience. Developing an app like Robinhood requires overcoming various challenges – both technology and marketing related, but since stock trading is a very topical field for investment, developing a product like Robinhood can be a good investment in modern technology.